<!-black-> Note: a devotional commentary is different from an exegetical commentary. In a devotional commentary like this one I can give the application of a verse rather than just the interpretation of a verse. The prophet, Nahum, wrote the book of Nahum. The name "Nahum" means one who consoles. His name can also mean "comfort". Why is his name significant? Because his prophecy is not just about God's judgment on the wicked but also on God's deliverance to those who love Him. How can God's deliverance be shown? When God eliminates those who harass, persecute, and oppress us. This deliverance was shown to the Israelites as a result of the fall of Nineveh and the collapse of the Assyrian empire. The enemy oppressing them would do so no more. This is a very consoling message to many folks like you and I who may be going through similar circumstances today. Nahum probably knew some of the other prophets of God such as Jeremiah, Habakkuk, and Zephaniah. Other than that, not much is known personally about this man. <!-black-> Where was Nahum from? <!-black-> Many folks can understand that the headquarters of Jesus Christ was in the town of Capernaum of Galilee. The name "Capernaum" means "village of Nahum". Why? Some folks have the opinion that Nahum was a founder or resident of the town of Capernaum. Or that Elkosh was a suburb of Capernaum or a small town in the near vicinity. There is a village close to Capernaum named Elkosh today but many believe that it was not there when Nahum was born. The name "Nahum" also means "comfort" and that is one of the titles of Jesus Christ: "Our Comforter". <!-black-> There was a town of Elkosh in Assyria, a few miles north of Nineveh. Nahum may have been among the Israelite slaves deported to the Nineveh area. Some folks think that Nahum lived there and prophesied against Nineveh and watched it fall like Jonah had hoped to do. <!-black-> There is a town in Judah also named Elkosh. Nahum may have lived there at some time. The book of Nahum was probably written between 663-612 B.C. We don't know where it was written from. Some bible scholars have the opinion that the book of Nahum is Hebrew poetry as well as prophecy and that most of the content of the first chapter is an old song the Israelites used to sing. This book was written because God wanted everyone to know what He was about to do. He would allow Assyria to be destroyed, and by doing that He would bring deliverance to His people. In other words, this book is a prophecy about the soon coming fall of Nineveh, the capital of Assyria, the Terror of the World. What was the main reason for Nineveh's predicted destruction? God was against Nineveh. (2 Kings 19:35). Assyria continued on and conquered Egypt, but Assyria eventually declined in power and was defeated by the armies of the Medes and Persians. Chapter 1 God is Great and Sovereign over all on the earth. Chapter 2 Nahum's prediction of the fall of Nineveh. Did this prediction come true? Yes. Nahum 3:1-10 Because of Nineveh's wickedness it will be destroyed as Thebes was. Nahum 3:11-17 Nineveh will be destroyed and buried. Nahum 3:18-19 A reference to Nineveh's king- a double reference verse? Nahum 3:19 Nineveh's enemies will rejoice over her fall. The theme of the book is God's judgment on Nineveh, the capital of the Assyrian Empire. Our comfort theme (our Nahum) is: Jesus Christ is our "Stronghold in the Day of Trouble"
<!-purple-> "The burden against Nineveh. The book of the vision of Nahum the Elkoshite"
(Nahum 1:1). <!-black-> The word "burden" means "judgment". <!-black-> When God was communicating with Abraham about the destruction of the city of Sodom, Abraham asked God, "Shall not the Judge of all the earth do right?" (Genesis 18:25). I believe that Nahum was struggling with the same question: was God just in allowing Nineveh to be destroyed? God reveals some of His attributes in this bible book. What kind of attributes? God is righteous, holy, and good. The answer to Nahum's question is that God is right (just) and good in allowing Nineveh to be destroyed. Doesn't that seem to paint God in a bad kind of way? It may seem that way to us but look at things from God's point of view. God must deal with sin. Why? Not only because it is His earth and His universe but because of WHO He is. God judges because He is just. And He loves while He judges. Because sin is real, God deals with sin in the life of each individual and He deals with sin in the life of each nation on His earth. God still moves in the lives of individuals and nations today. God is SOVEREIGN AND SUPREME and He does what He wants to do- and His actions are true and just. <!-purple-> says the Lord. Your ways and your doings have procured these things for you. This is your wickedness, because it is bitter, because it reaches to your heart"
<!-purple-> "I saw in the visions of my head while on my bed, and there was a watcher, a holy one, coming down from heaven. He cried aloud and said thus: chop down the tree and cut off its branches, strip off its leaves and scatter its fruit. Let the beasts get out from under it, and the birds from its branches. Nevertheless leave the stump and roots in the earth, bound with a band of iron and bronze, in the tender grass of the field. Let it be wet with the dew of heaven, and let him graze with the beasts on the grass of the earth. Let his heart be changed from that of a man, let him be given the heart of a beast, and let seven times pass over him. This decision is by the decree of the watchers, and the sentence by the word of the holy ones, in order that the living may know that the Most High rules in the kingdom of men, gives it to whomever He will, and sets over it the lowest (humblest) of men"
(Genesis 19:1). They gave their advice to God who judged the city by destroying it from the face of the earth. I imagine that these same watchers went to the city of Nineveh. What did they observe there? The nation was given to violence, vice, human rights violations, and immorality. Satan ruled supreme and God was rejected. It is very likely that these watchers gave their counsel to God to destroy the city of Nineveh. <!-black-> The earth is NOT spinning out of control. God is a BIG GOD. He is in control. God is overseeing the affairs of this world. He is dealing with the sin(s) of mankind and is carrying out His plans and purposes for this earth. Sometimes we don't understand what He is doing in our personal lives or our nation but when that happens all we have to do is to trust Him. Never underestimate your prayers on behalf of those who are in a rulership position in the governments of this world. <!-purple-> "God is jealous, and the Lord avenges; the Lord avenges and is furious. The Lord will take vengeance on His adversaries, and He reserves wrath for His enemies"
<!-black-> God is jealous for you and I. He loves us so much that He died for each of us on the cross of Calvary. He owns you and I if we belong to Him. How is He jealous for us? If we give ourselves to sin then we are in danger of getting a new owner. God loves us and wants us. He created you and I. He is jealous when we flirt with sin. <!-purple-> "Then he (Moses) said to Korah and his followers, "Tomorrow morning the Lord will show us who belongs to Him and who is holy. The Lord will allow those who are chosen to enter His holy presence..."
<!-black-> God is a just judge. He will not let the wicked escape their punishment. Someone must pay the penalty for their transgression(s). God provided a Redeemer for you and I. When any individual or any nation rejects God's redemption (provided in Jesus Christ by grace through faith), then judgment must follow. There is no other alternative- and that is just the way things are in God's universe. <!-blue-> Ownership Truths (who owns me and you)? <!-purple-> "The mountains quake before Him, the hills melt, and the earth heaves at His presence, yes, the world and all who dwell in it"
<!-red-> "The Lord, the Lord God, merciful and gracious, longsuffering, and abounding in goodness and truth, keeping mercy for thousands, forgiving iniquity and transgression and sin..."
<!-purple-> "The Lord is good, a stronghold in the day of trouble; and He knows those who trust in Him"
<!-red-> "I AM the Good Shepherd. The Good Shepherd gives His life for the sheep"
<!-purple-> "He will cover you with His feathers, and under His wings you will find refuge; His faithfulness will be your shield and rampart..."
<!-red-> "I took care of you in the wilderness, in that dry and thirsty land..."
<!-purple-> "For the Lord watches over the path of the godly..."
<!-purple-> "But with an overflowing flood He will make an utter end of its place (Nineveh), and darkness will pursue His enemies"
<!-black-> You and I can trust God's word. Why? Because historians tell us that when Nineveh was surrounded by enemy armies the city was nearly impossible to take. For two years the city was surrounded and every attack had failed. But then in the third year heavy rains came. A literal flood caused the Tigris River to overflow and the waters washed away part of the wall of the city. The enemy attacked through this weakness in the wall and conquered the city. The actual events, as shown through history, were a perfect fulfillment of Nahum's prophecy. <!-purple-> "From you comes forth one who plots evil against the Lord, a wicked counselor"
<!-black-> This might very well be a double reference verse. I am sure there were many evil counselors to the King of Assyria from time to time. The majority of this evil counseling probably went on in the palace in Nineveh and maybe that is one reason why God allowed the overflowing river to destroy the palace. In insurance terms today, something like that is considered an act of God. God destroyed the palace where the evil plans were laid for the conquest of the world- a world without Him. (Daniel 10:13). It makes you wonder if there was a Prince of Assyria- a powerful fallen angel who carried out Satan's will there. There was also probably one in the Egyptian city of Thebes, as well. <!-purple-> "Behold, on the mountains the feet of Him who brings good tidings, Who proclaims peace! O Judah, keep your appointed feasts, perform your vows. For the wicked one shall no more pass through you; He is utterly cut off"
<!-black-> God through the prophet, Nahum, encourages His people to observe their religious feasts. Why? Because no longer will the Assyrian armies march through the land of Israel because their capital city, Nineveh, is going to be defeated and conquered. I believe this could be a double reference verse. Why? Because in the last days, Israel will once again face a similar enemy. From who? From the armies of the world dictaror (the antichrist). Israel's enemies will fall then also. Then Jesus Christ will bring world peace as their Messiah. This will be the final deliverance for Israel before the Millennial Reign of Christ. This will also be a time of celebration and joyous blessing and worship. <!-purple-> This is what the Sovereign Lord says: <!-red-> "Long ago my people went to live as resident foreigners in Egypt. Now they have been oppressed without cause by Assyria. And now, what is this? asks the Lord. Why are my people enslaved again? Those who rule them shout in exultation. My Name is being blasphemed all day long. But I will reveal My name to My people, and they will come to know its power. Then at last they will recognize that it is I who speaks to them." <!-purple-> How beautiful on the mountains are the feet of those who bring good news of peace and salvation, the news that the God of Israel reigns! The watchmen shout and sing with joy, for before their very eyes they see the Lord bringing His people home to Jerusalem. Let the ruins of Jerusalem break into joyful song, for the Lord has comforted His people. He has redeemed Jerusalem. The Lord will demonstrate His holy power before the eyes of all the nations. The ends of the earth will see the salvation of our God"
<!-purple-> "For whoever calls on the name of the Lord shall be saved. How then shall they call on Him in whom they have not believed? And how shall they believe in Him of whom they have not heard? And how shall they hear without a preacher? And how shall they preach unless they are sent? As it is written: How beautiful are the feet of those who preach the gospel of peace, Who bring glad tidings of good things!" <!-purple-> "The gates of the rivers are opened, and the palace is dissolved"
<!-black-> Some historians believe that "the gates of the rivers" were the gates of the large irrigation ditches that were opened by the enemy soldiers who surrounded Nineveh. Opening the flood gates helped to overflow all of the rivers in the area. The Khoser (Khausser) River and the Zab River flowed into the city while the Tigris River flowed outside of the city. The interior of the city was flooded. This helped to undermine the foundation of the palace. Opening the flood gates into the Tigris River also helped the overflowing river water to dissolve one section of the exterior walls surrounding the city. This was easy as these walls were made of sun-dried mud brick. Not only did a flood of waters come pouring into the city but also a flood of enemy soldiers. They entered through the gap in the wall made by the flood waters. Where the Khoser River joined the Tigris River was located the Palace of Sennacherib. Actually, there were two palaces- one that belonged to King Sennacherib and one that belonged to King Assurbanipal. Within the palace of King Sennacherib was the Library of Assurbanipal that contained over 100,000 volumes of early Assyrian and Babylonian literature. Some of this recovered literature from the archaeologists is in the British Museum. These palaces were built by the blood and sweat of many people who were turned into slaves. These palaces were meant to stand for a thousand years or more. They were to be everlasting monuments to Assyria's pride and dominance- the rule of the strong over the weak, the rule of Satan over all peoples in the world. These palaces were built by folks who were suffering, mistreated, unloved, and oppressed. How can any monuments to greatness be respected when associated with massive human rights violations? Did the palaces last one thousand years? No. God brought the palaces down in judgment- not only the palaces but the entire city- not only the city but the entire nation. He told Nahum, so to speak, to preach their funeral- and God did exactly what He said He was going to do. He said He was going to judge them and He judged them. Today, the city of Nineveh is still buried. It will never be physically resurrected. Why? Because Nineveh serves as a warning to every individual and to every nation on the earth how we are expected to conduct ourselves. God rules supreme and He expects folks to love Him and to love each other. <!-purple-> "She is empty, desolate, and waste! The heart melts, and the knees shake; Much pain is in every side, and all their faces are drained of color"
<!-black-> The Assyrian soldiers of Nineveh saw that their battle was lost. They were afraid to fight and die for a lost cause. They had lost the battle and now they had to suffer the agony of defeat. Every soldier of any war fights to win. Defeat can be nearly unbearable for many. <!-red-> "Behold, I am against you, says the Lord of hosts, I will burn your chariots in smoke, and the sword shall devour your young lions; I will cut off your prey from the earth, and the voice of your messengers shall be heard no more"
<!-black-> In spite of the rain and the floods, part of Nineveh was set on fire. It could be that some troops in the Assyrian military burned up valuable assets to keep it from falling into the hands of their enemy, or the enemy set parts of Nineveh on fire to drive out enemy troops and to help conquer the city. Nahum 2:13 at the start of Nahum chapter 3 as it is the same train of thought. <!-purple-> "Because of the multitude of harlotries of the seductive harlot, the mistress of sorceries, who sells nations through her harlotries, and families through her sorceries..."
<!-black-> The bible teaches that idol worship is spiritual adultery to God. The words "sorceries" or "witchcrafts" give us a clue as to the spiritual climate of Nineveh. The folks of Nineveh were totally dedicated to Satan. Elevating Satan and sin and putting down God and the light of His word is a backwards scenario for any individual or nation. This will always bring the judgment of God. Nineveh had the light of God at one time- this was proved when Jonah preached to them, they repented, and God spared them. When you or I reject light- God and His word- (the light of the gospel), our responsibility is greater. Does that mean that our judgment is greater? God was completely justified in judging Nineveh for many reasons- but mostly for their rejection of Him and His word. They rejected God and elevated Satan. Their priorities were reversed. They were so deep into Satan worship (spiritual harlotry) and sorcery (witchcraft) that they were reprobate (beyond the hope of salvation). <!-purple-> "Then one of the seven angels who had the seven bowls came and talked with me, saying to me, Come, I will show you the judgment of the great harlot who sits on many waters, with whom the kings of the earth committed fornication, and the inhabitants of the earth were made drunk with the wine of her fornication. So he carried me away in the Spirit into the wilderness. And I saw a woman sitting on a scarlet beast which was full of names of blasphemy, having seven heads and ten horns. The woman was arrayed in purple and scarlet, and adorned with gold and precious stones and pearls, having in her hand a golden cup full of abominations and the filthiness of her fornication. And on her forehead a name was written: MYSTERY, BABYLON THE GREAT, THE MOTHER OF HARLOTS AND OF THE ABOMINATIONS OF THE EARTH. I saw the woman, drunk with the blood of the saints and with the blood of the martyrs of Jesus. And when I saw her, I marveled with great amazement"
<!-black-> The words harlot, fornication, blasphemy, abominations, filthiness, etc. as used by God the Holy Spirit give us a clue as to the spiritual climate of the New Babylon of our future. The folks of New Babylon, the capital city of the world, will be totally dedicated to Satan. And I repeat that elevating Satan and sin and putting down God and the light of His word is a backwards scenario for any individual or nation. This will always bring the judgment of God. And New Babylon will fall just as surely as ancient Nineveh fell- never to be remembered in a positive way again. <!-black-> Why does God sometimes use symbolic language? I think that it allows Him to give a general message to us without having to reveal specific details about time or events. <!-red-> "It shall come to pass that all who look upon you will flee from you, and say: Nineveh is laid waste! Who will bemoan her? Where shall I seek comforters for you?" <!-black-> There would not be one mourner at Nineveh's funeral. Instead of mourning her destruction, they would rejoice. Why? Because of her oppressive, hostile, and domineering ways of treating people. <!-black-> Have you ever worked for a boss who was critical, hostile, and shaming to you? Or, maybe a boss who tried to control you with anger? A boss with that kind of attitude is usually classified as a "gang pusher" rather than as a manager. And when you quit that job so that you did not have to work for that individual any longer, how did you feel? You probably felt free. You were not opressed any longer. You did not morn, rather, you did just the opposite and rejoiced. There was no love lost there because there was none to start with. The old rule is "to bloom where you are celebrated, not where you are tolerated". The point is: everyone was glad to see Nineveh gone. <!-red-> "Are you better than No Amon that was situated by the river, that had the waters around her, whose rampart was the sea, whose wall was the sea?" <!-black-> No or No-Amon was another name for Thebes, the capital city of Upper Egypt, at that time. Upper Egypt was also called the Thebaid. Thebes was just like Nineveh in many respects and yet it was destroyed. Nineveh would be no different. Why does God use the City of Thebes as another bad example? It could be that the Assyrians were very familiar with this city because they were the ones who conquered it in 663 B.C. Thebes thought that it was an invincible city that could never be conquered. It was surrounded by desert and was next to the Nile River that would keep any enemy army from approaching it. Yet it fell. 1) Rejected God and His will. Satan and idol worship were elevated. 2) Was greatly hated because of human rights violations. 3) Was full of wealth (and luxury) to the exclusion of the poor and needy. 4) Had many folks there who were greatly possessed and/or oppressed by demon spirits. <!-red-> "I will punish Amon, the god of Thebes, and all the other gods of Egypt. I will punish its rulers and Pharaoh, too, and all who trust in him"
<!-red-> "I will smash the idols of Egypt and the images at Memphis. There will be no rulers left in Egypt; anarchy will prevail throughout the land! I will destroy Pathros, Zoan, and Thebes, and they will lie in ruins, burned up by My anger. I will pour out my fury on Pelusium, the strongest fortress of Egypt, and I will stamp out the people of Thebes. Yes, I will set fire to all Egypt! Pelusium will be racked with pain; Thebes will be torn apart; Memphis will live in constant terror..."
<!-purple-> "Your injury has no healing, Your wound is severe"
<!-black-> Except for the time when they repented after the preaching of Jonah, the folks of Nineveh were a continually violent and wicked people. God judges individuals and nations who are wicked. Nineveh serves as an everlasting example of this fact. <!-red-> "You will have no more children to carry on your name. I will destroy all the idols in the temples of your gods. I am preparing a grave for you because you are despicable and do not deserve to live!" <!-purple-> "The attack begins! See their scarlet uniforms! Watch as their glittering chariots move into position, with a forest of spears waving above them. The chariots race recklessly along the streets and through the squares, swift as lightning, flickering like torches. The king shouts to his officers; they stumble in their haste, rushing to the walls to set up their defenses. But too late! The river gates are open! The enemy has entered! The palace is about to collapse!" <!-purple-> "There is no healing for your wound; your injury is fatal. All who hear of your destruction will clap their hands for joy. Where can anyone be found who has not suffered from your cruelty?" <!-purple-> "And the Lord will strike the lands of the north with His fist. He will destroy Assyria and make its great capital, Nineveh, a desolate wasteland, parched like a desert. The city that once was so proud will become a pasture for sheep and cattle. All sorts of wild animals will settle there. Owls of many kinds will live among the ruins of its palaces, hooting from the gaping windows. Rubble will block all the doorways, and the cedar paneling will lie open to the wind and weather. This is the fate of that boisterous city, once so secure. "In all the world there is no city as great as I," it boasted. But now, look how it has become an utter ruin, a place where animals live! Everyone passing that way will laugh in derision or shake a defiant fist"
<!-black-> The prophecy of this book was fulfilled many years ago. It happened just as God had predicted. So, what is this prophecy's relevance to you and I today? Remember the general rule: all prophecy is not to us but all prophecy is for us. What does that mean? It means that there is a message from God to us in this book of the bible. <!-black-> Why would God choose to give us a message about judgment from someone whose name meant comfort? One way any judgment can be a comfort to you or I is when our sworn enemies (the ones who have dominated, persecuted, and hurt us) get just what they deserve. But also let us do our part and forgive those who have hurt us. <!-black-> When was the book of Nahum written? For sensationalism purposes some writers want to put Nahum in the thick of the battle for Jerusalem. The cruel Assyrian army surrounded the city but an angel from God destroyed 185,000 of their soldiers in one night. This battle for Jerusalem took place about 699 B.C. This battle makes for exciting reading but the time line of biblical history does not appear to place Nahum there at that time. Why? Because Nahum refers to the fall of Thebes that took place in 663 B.C. and his book was not written until after that time. <!-black-> Here is a brief timeline of the history of Israel and Judah as compared to the Assyrian Empire. Note: not all historians agree on all of the dates- some dates differ as much as several years. <!-black-> Nimrod founded Nineveh (Genesis 10:11-12). <!-black-> Nineveh and Babylon were rival cities (much like Rome and Carthage were in later years). Both cities stood in the Euphrates Valley in ancient Mesopothamia. Some Christian historians think that these cities were not that far from the biblical Garden of Eden. These two cities were about 300 miles apart from each other. 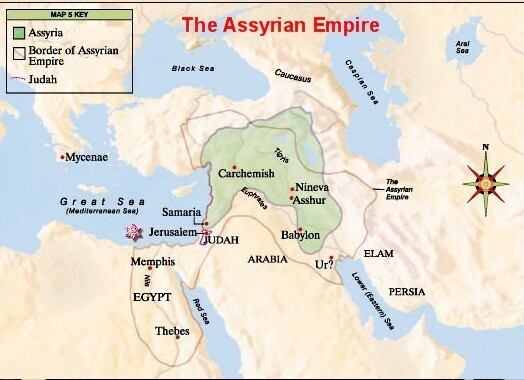 <!-black-> The Assyrian Empire was very powerful for about 300 years (900-612 B.C.). Nineveh was it's capital city. Under Assyrian King Shalmaneser II (860-825 B.C. ), the Assyrians began to attack Israel (the Northern Kingdom). <!-black-> God ordered His prophet, Jonah, to Nineveh. He preached to them because they were headed in the wrong spiritual direction. They repented and were headed in the right direction. The Book of Jonah was written between 800-750 B.C. from somewhere in the northern kingdom (this was in the early 8th century B.C.). <!-black-> Assyrian King Adad-Nirari (810-782 B.C.) was possibly the King of Nineveh when Jonah preached to the populace of Nineveh. This king took tribute money from Israel. Assyrian King Ashur-dan III (772-755 B.C.). But then the Assyrians made wrong choices and headed in the wrong spiritual direction. They became corrupt and once again they became violent, wicked, and immoral as a people. <!-black-> Assyrian King Tiglath-pileser III (747-727 B.C.) deported most of the Israelites from the Northern Kingdom of Israel to Assyria. How did this happen? 734-732 B.C. (over a 2 year period of time). <!-black-> Assyrian King Shalmaneser (727 to 722 B.C.) sent his army to the capital city of Israel, Samaria, and besieged it. 729-724 B.C. (about a 5 year period of time). <!-black-> Assyrian King Sargon II (722-705 B.C.) deported the rest of the folks in Judah to Assyria. 699 B.C. but his army was destroyed by God at that time at Jerusalem. The prophet Isaiah prophesied against him. In other words, God killed most of his army while they were preparing to attack Jerusalem and this king retreated to Nineveh. In 680 B.C. King Sennacherib died in the temple of Nisroch. <!-black-> Jerusalem was not conquered at this time. Jerusalem, as the capital of Judah, would continue to exist for another 150 years or so past the fall of the Northern Kingdom. Instead of learning their lesson from watching the fall of Israel (the Northern Kingdom), they repeated the mistakes of Israel and eventually ended up the same way under the Babylonians. Assur-banipal (668-626 B.C.) ruled. He destroyed the city of Thebes in Egypt in 663 B.C. He was also called Sardanopalus and Osnapper in the Assyrian writings. <!-black-> For another 100 years or so Assyria continued to be powerful and arrogant but then it's decline started. There was fighting in Assyria. Assyria was invaded and began its decline around 625 B.C. The book of Nahum was written between 663-612 B.C., after the fall of Thebes. <!-black-> Asshur, the ancient capital of Assyria fell in 614 B.C. to the Medes and Persians. <!-black-> King Sennacherib's great grandson, Assur-etil-ilani (Sin-sar-iskun) was also called Saracos (Saracus), was the last ruling king of Nineveh. It is thought by many that the prophet Nahum prophesied against Assyria while this king was ruling. <!-black-> Nineveh fell two years later in 612 B.C. God warned the Assyrians through His prophet Jonah to repent. God gave them a second chance. They did repent and God spared their lives. Many folks believe that if someone does something wrong and repents of it, that they should be given another chance. <!-black-> At least 40 years went by (about one generation), after the revival in Nineveh, and the Assyrians went back to their sinful and violent ways. Once again they got God's attention. This time, God does not give them a chance to repent. They are reprobate- beyond the hope of salvation. His message through Nahum to the Assyrians is short and to the point. I paraphrase his message- it probably went something like this: "prepare to meet your God. You have been weighed in the balances and found wanting. God is going to allow you to be destroyed and He will even attend your funeral." God's judgment is going to finish them individually and as a nation. A powerful message here is that God will totally destroy a rebellious and wicked people. God is going to "cut her off" and dig her grave. Nineveh will never rise again from the ashes. <!-black-> God may give each one of us one or more chances in life to get right with God, however, He only gives us one life. God gives us each a call to repentance. God does not give us two lives to get it right. He gives us one life (one chance) to get right with Him. We better take this to heart and act while we yet have time. <!-red-> The lamp of the body is the eye. If therefore your eye is good, your whole body will be full of light. But if your eye is bad, your whole body will be full of darkness. If therefore the light that is in you is darkness, how great is that darkness! <!-black-> Sometimes light is rejected. How can light be darkness in any society? It is the rejection of God, His will, and His word. When that happens the light is rejected and darkness (Satan) rules supreme. Bad choices have consequences. This holds true for individuals as well as nations. This happened to Nineveh and God judged Nineveh. <!-black-> When will a sinful nation be judged? <!-black-> For an answer to this question, let's take a look in God's holy word. Assurance was given by God to Abram of the land of Canaan for an inheritance. But there was a problem. The problem was: how can YOU give us land that someone else owns? The final solution is that God owns it all and He will give it to who He wants to. The people that live on this land will have to be destroyed. Why? Because they worshipped the devil rather than God, they were violent, and they were immoral. They burned some of their children alive in worship to Satan. It has been said that the populace was infected with venereal disease and that even their animals had it. The land had to be totally cleansed and God used Joshua and his army to do the job. <!-purple-> "I know that the Lord has given you the land, that the terror of you has fallen on us, and that all the inhabitants of the land are fainthearted because of you. For we have heard how the Lord dried up the water of the Red Sea for you when you came out of Egypt, and what you did to the two kings of the Amorites who were on the other side of the Jordan, Sihon and Og, whom you utterly destroyed. And as soon as we heard these things, our hearts melted; neither did there remain any more courage in anyone because of you, for the Lord your God, He is God in heaven above and on earth beneath"
<!-black-> God determines the time when any sinful nation will be judged. The reason why Abraham's grandchildren must not have the land of promise in possession till the fourth generation after Abraham was because the timing was not yet right (the iniquity of the Amorites was not yet full). <!-purple-> "But there was no one like Ahab who sold himself to do wickedness in the sight of the Lord, because Jezebel his wife stirred him up. And he behaved very abominably in following idols, according to all that the Amorites had done, whom the Lord had cast out before the children of Israel"
<!-dark green-> "Israel cannot be possessed of Canaan till the Amorites be dispossessed; and they are not yet ripe for ruin. The righteous God has determined that they shall not be cut off till they have persisted in sin so long, and arrived at such a pitch of wickedness, that there may appear some equitable proportion between their sin and their ruin; and therefore, till it come to that, the seed of Abram must be kept out of possession. (2.) Some people�s measure of sin fills slowly. The Sodomites, who were sinners before the Lord exceedingly, soon filled their measure; so did the Jews, who were, in profession, near to God. But the iniquity of the Amorites was long in the filling up. (3.) That this is the reason of the prosperity of wicked people: the measure of their sins is not yet full. The wicked live, become old, and are mighty in power, while God is laying up their iniquity for their children." <!-red-> "Fill up, then, the measure of your fathers' guilt"
<!-red-> "Vengeance is Mine, and recompense; their foot shall slip in due time; for the day of their calamity is at hand, and the things to come hasten upon them..."
<!-purple-> "The whole land is brimstone, salt, and burning; it is not sown, nor does it bear, nor does any grass grow there, like the overthrow of Sodom and Gomorrah, Admah, and Zeboim, which the Lord overthrew in His anger and His wrath. All nations would say: Why has the Lord done so to this land? What does the heat of this great anger mean? Then people would say: Because they have forsaken the covenant of the Lord God of their fathers, which He made with them when He brought them out of the land of Egypt; for they went and served other gods and worshiped them, gods that they did not know and that He had not given to them. Then the anger of the Lord was aroused against this land, to bring on it every curse that is written in this book. And the Lord uprooted them from their land in anger, in wrath, and in great indignation, and cast them into another land, as it is this day. The secret things belong to the Lord our God, but those things which are revealed belong to us and to our children forever, that we may do all the words of this law"
<!-red-> "Behold, I am against you, says the Lord of hosts; I will lift your skirts over your face, I will show the nations your nakedness, and the kingdoms your shame. I will cast abominable filth upon you, make you vile, and make you a spectacle"
<!-black-> The average length of time for the lifespan of any nation, since the beginning of recorded history, is about 200 years. Some nations exist for a shorter length of time and some exist for a longer length of time. (Ezekiel chapters 38 & 39). When those nations chose to put Satan first and became violent and immoral, God allowed the super torpedo of sin to sink each of them. Sin splits and destroys- that is the nature of sin. A nation's own sins can bring it down. When the time is right, God will allow it to be destroyed. God's judgment always stands opposite His mercy. <!-black-> God may destroy the nation Himself, or, He may allow a hostile nation to destroy it. When the time is right, God will allow it to be destroyed. This principle is true today for each nation and for each nation in the future. A wise person once said: "If we don't learn from the past then we are doomed to repeat it." Another wise person wrote in the bible that "history repeats itself"
<!-purple-> "Then Samuel said: What is more pleasing to the Lord: your burnt offerings and sacrifices or your obedience to His voice? Obedience is far better than sacrifice. Listening to Him is much better than offering the fat of rams. Rebellion is as bad as the sin of witchcraft, and stubbornness is as bad as worshiping idols. So because you have rejected the word of the Lord, He has rejected you from being king"
<!-purple-> "How beautiful on the mountains are the feet of those who bring good news of peace and salvation, the news that the God of Israel reigns! The watchmen shout and sing with joy, for before their very eyes they see the Lord bringing His people home to Jerusalem. Let the ruins of Jerusalem break into joyful song, for the Lord has comforted His people. He has redeemed Jerusalem. The Lord will demonstrate His holy power before the eyes of all the nations. The ends of the earth will see the salvation of our God"